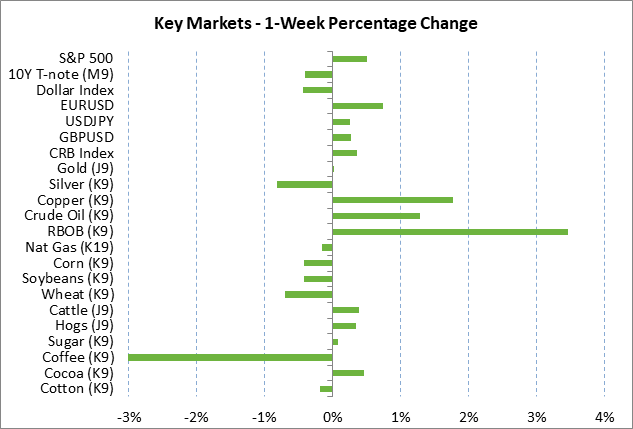 Weekly global market focus -- The U.S. markets this week will focus on (1) trade tensions as the US/Chinese talks continue over the phone and as Japanese trade officials visit Washington this week to begin US/Japanese trade talks, (2) Q1 earnings season with 50 of the S&P 500 companies reporting this week, (3) Fed policy with six appearances by Fed officials this week and with Wednesday's Beige Book report, (4) the Treasury's sale of 5-year TIPS on Thursday, (5) a fairly busy U.S. economic calendar ahead of Friday's holiday, and (6) oil prices which posted a new 5-month high last Tuesday on strong OPEC+ production-cut compliance and the fighting in Libya that could reduce Libyan oil output. The European markets this week will focus on whether Thursday's Eurozone manufacturing PMI shows signs that the worst is over for the Eurozone economy (expected +0.5 to 48.0 after March's -1.8 drop to 47.5). 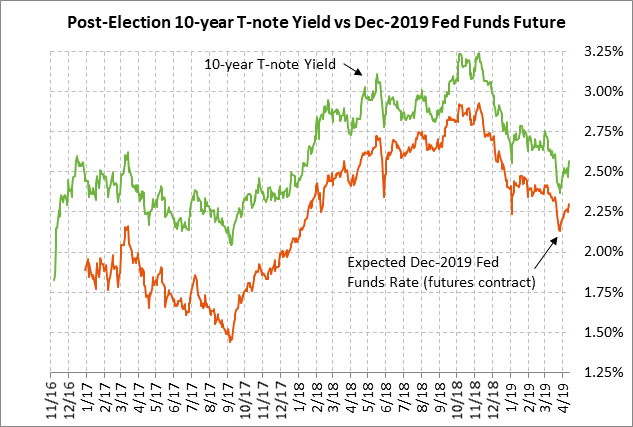 The European markets will also be watching UK Brexit negotiations and whether EU officials approve the mandate for the US/EU trade talks to begin. In Asia, the focus will mainly be on Tuesday night's Chinese economic data with Q1 GDP expected to ease to +6.3% from Q4's +6.4%. The consensus is for China's March industrial production to improve to +5.6% year-to-date (from Feb's +5.3%) and for March retail sales to improve to +8.3% year-to-date (from Feb's +8.2%). US/Japanese trade talks begin this week -- Japanese Trade Minister Motegi will meet with USTR Lighthizer in Washington this week to kick off the US/Japanese trade talks that were agreed upon by President Trump and Japanese Prime Minister Abe last September. Japanese officials are expecting a slow pace for the US/Japanese talks because U.S. trade officials are currently focused mainly on finalizing a US/Chinese trade agreement. Japan's Finance Minister Aso told reporters last Friday that, "They're too busy with China. I don't think they can spare enough people to talk to us. There have been no official requests made directly to us on what the U.S. would like to achieve." Meanwhile, the markets are waiting to see whether EU officials this week will approve the mandate that EU Trade Commissioner Malmstrom needs to begin US/EU trade talks. Hanging over the U.S. trade talks with both the EU and Japan is President Trump's threat to slap tariffs on imported autos. The Commerce Department in February gave the White House a report that is still secret but likely recommended that the U.S. should go ahead with tariffs on imported autos on national security grounds. The White House is due to make a decision on imported auto tariffs by May, although that decision can be delayed. The threat of tariffs on imported autos is mainly aimed at drawing trade concessions from Japan and the EU. The US/Chinese trade talks so far remain on track. Treasury Secretary Mnuchin on Saturday said that, "The U.S. and China are discussing whether to hold more in-person meetings. We're hopefully getting very close to the final round of these issues." 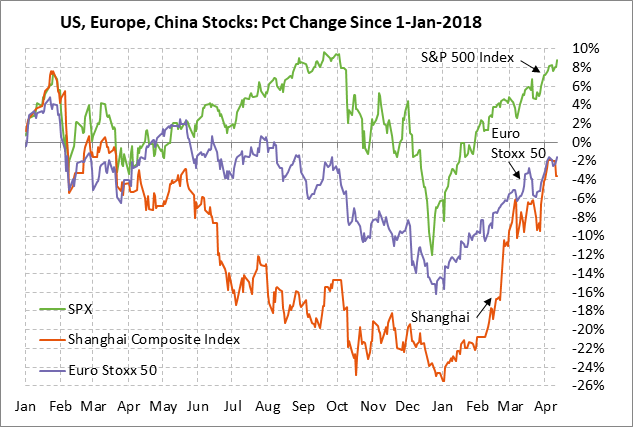 Mr. Mnuchin late last week said that the U.S. and China are "pretty much" agreed on an enforcement mechanism, which has been one of the major sticking points. Conservative/Labour Brexit talks continue this week -- Conservative and Labour party officials this week will continue their negotiations on a Brexit compromise even though Parliament is out of town on their Easter break this week. The Brexit deadline last week was extended until October 31, which means the pressure is now off and there is no threat of a no-deal Brexit until at least October. In the event that the Conservative and Labour parties reach a Brexit compromise and Parliament approves Prime Minister May's Brexit separation agreement, then the UK will be able to leave the EU and will have a quiet transition period through December 2020. If there is no agreement, then Ms. May is expected to go back to Parliament for a new series of indicative votes to see if there is a plan that Parliament will support. Chancellor of the Exchequer Hammond last Friday said that he expects Prime Minister May to continue to lead the government until Parliament approves a Brexit plan, meaning there is no near-term threat of a new Conservative Party leader or a snap election. Q1 earnings growth expected -2.2% y/y as earnings season begins -- Q1 earnings season begins in earnest this week with 50 of the S&P 500 companies reporting. Notable reports this week include Goldman Sachs and Citigroup today; Bank of America, Blackrock and Netflix on Tuesday; and Morgan Stanley on Wednesday. The consensus is for SPX Q1 earnings growth to fall -2.2% y/y, according to Refinitiv, due to the high year-earlier base when earnings spiked upward on the massive 1-Jan-2018 tax cut. The good news, however, is that Q1 revenue growth is expected to be solid at +5.0% y/y. 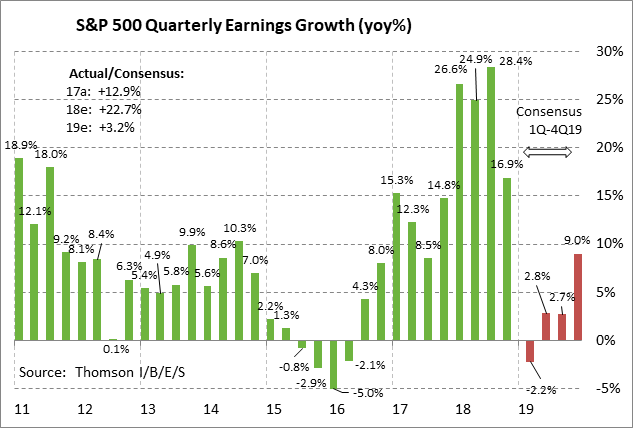 The consensus is for earnings growth to improve a bit as 2019 wears on with SPX earnings growth of +2.8% in Q2, +2.7% in Q3, and +9.0% in Q4, leading to overall 2019 growth of +3.2% (vs +22.7% in 2018).